Note: This article originally appeared on Intrepid Travel’s blog, The Journal. To explore the Caucasus is to permeate living history. It is to be humbled by noble mountains and ancient seas, to be woven into a tapestry made up of some of the world’s earliest known cultures. It is to become infused by saffron-scented alleyways, while imagining the plodding of hooves from a Silk Road caravan on winding, dirt roads still in use today. It is to hear the ringing out of the coppersmith’s tools wafting into the foothills of a rural village in Azerbaijan, to smell the golden yeast of flatbread hissing out from a clay oven on a Georgian roadside, or to stand on a precipice at the edge of the world amidst the stone stillness of an Armenian monastery, basking in the reverence of all that has come before you. The relatively unassuming pocket of the world known as The Caucasus, generally consisting of three countries – Georgia, Armenia and Azerbaijan – is bookended by the Black and Caspian Seas and is bordered as a region by Turkey, Iran and Russia. It is dotted by one of the world’s grandest mountain chains, boasts nine of the world’s eleven climactic zones, and breathes into life a cross section of Europe and Asia completely unlike anywhere else on Earth. While the landscapes, customs and cultures are reason enough to visit, nowhere is the true character of the region more evident than in its distinctive food traditions. Travelers who have enjoyed the traditional cooking of Mediterranean or Persian influence will find some familiarities present in the Caucasus: a bounty of fresh produce, the harmony of savory and sweet within meat and grain-based dishes and a deep, spiritual love of bread – ubiquitous, fragrant and essential. It should be noted that vegetarians, too, will do very well eating throughout the region as a plethora of dishes rely solely on this garden of a land and its variously grilled, stuffed and pickled vegetables, along with hearty breads, rice preparations and all manner of dairy stemming from rich, open-aired alpine pastures. 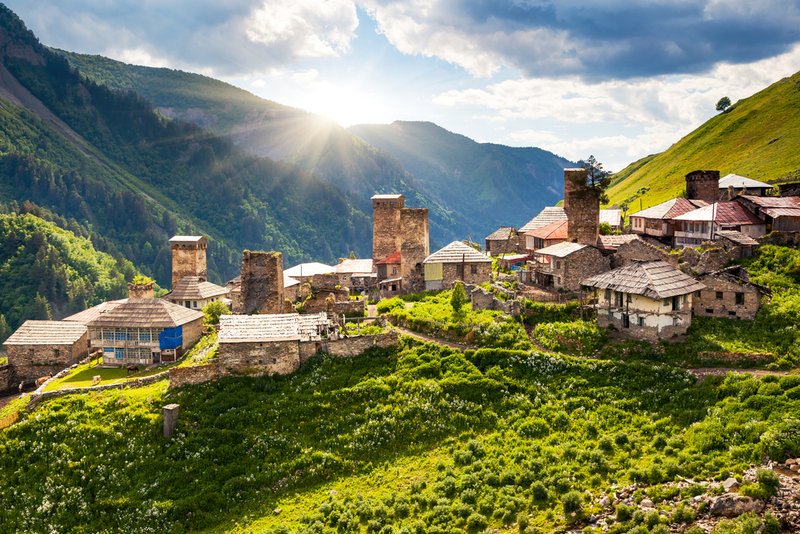 Whether you are a student of history, a lover of nature, or are propelled around the globe by your appetite, the Caucasus – much like the traditional tables of their respective countries – have everything on offer. It might be fair to say that Georgia stands out among the three countries as having the greatest variety and diversity of dishes, as well as some of the most distinct foods found anywhere. A consideration of Georgian wine is deserving of an article unto itself, but as the world’s oldest known winemaking culture, and the birthplace of the underground practice of fermentation in clay vessels known as Kvevri, the country remains a singular destination in which to experience viticultural delights that simply are not exported or available elsewhere. Georgia features grilled meats and kabobs similar to those found throughout the Caucasus, although with a greater array of condiments and sauces for pairing. Whether made from local plums or distilled into a syrupy pomegranate drizzle, the marriage of sweet and savory with tart undercurrents is an ever-present alchemy that will not disappoint. By turns you will reach in among your dining companions – your family at the table – to break off dense sections of one of a variety of Khachapuri. This is an iconic cheese bread, with regional variations, topped with a raw, farm-fresh egg. Steam may float into your periphery as someone nearby cuts into a plate of Khinkali, savory pouches of Mongol-influenced lamb, beef or mushroom, encased in a soft but toothsome pastry, twisted upwards to form their own convenient handle. In addition to the scores of excellent kabob stalls and dumpling houses throughout the country, there are some genuinely fantastic restaurants providing both traditional and more innovative takes on the ancient cuisine, in particular Shavi Lomi(Tbilisi), Puris Sakhli (Tbilisi) and Pheasant’s Tears (Sighnaghi). 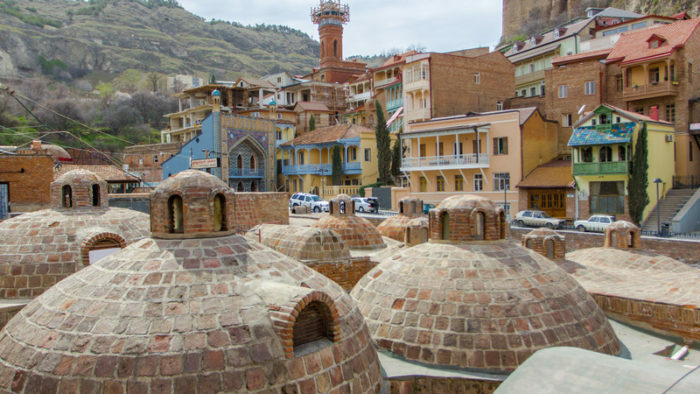 If one has already walked the crooked, romantic streets of the Georgian capital city, Tbilisi, and found themselves amidst the country homes and mountain communities of its environs, heading south across the Armenian border will open entirely new vistas, not to mention original culinary offerings. 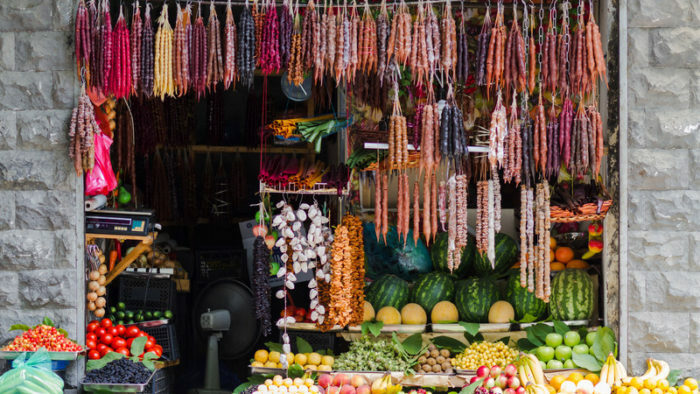 Travelers familiar with Turkish cuisine will no doubt recognize the omnipresence of stuffed vegetables, Tolma, but also fragrant mounds of rice and cured meats such as Basturma (beef). The highly prized trout of Lake Sevan is also not to be missed as you wind your way from peak to peak in exploration of Armenia’s remote monasteries – among the world’s oldest and most well preserved. Be certain to stop and enjoy the many side-of-road, wood-fired corn on the cob stalls. Run by local families, they’re cooked to order for those passing by. The countryside foods entail hearty preparations with peasant roots, while the highly cosmopolitan capital of Yerevan offers more international fare and a thriving street side café culture reminiscent of European cities. While Armenian wine has not so far enjoyed the same global reputation as neighboring Georgia, its indigenous grapes are no less interesting and the local wines are an excellent compliment to the deep flavors of both traditional barbequed meats and vegetables. Following a meal you will have the opportunity to experience Armenian brandy, among the world’s finest, and largely thought to rival the finest cognacs of France. For a truly local, boisterous night of feasting with live music and vodka all around, visit Yerevan Tavern, or for a more refined meal of expertly-prepared traditional dishes try Dolmama (Yerevan). If travelers find Georgia and Armenia to be ‘off the beaten path’ destinations for adventure, the complexities of Azerbaijan may take these intrepid wanderers to a whole new level of cultural immersion and wonder. 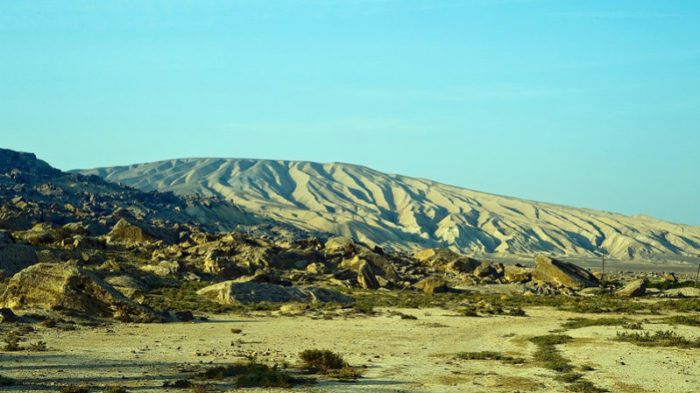 Known since ancient times as ‘The Land of Fire’ Azerbaijan’s earthen storehouse of natural gas and oil have cemented its reputation over time as both a place of mysterious power and a rich bastion of economic potential. A quick jaunt around Baku will reveal not only ancient palaces and fortresses, but also ultra-futuristic architectural experiments that have led some to label it, and its flashy new money identity, as the next Dubai. However, just on the outskirts of the capital remain expansive fields of shimmering oil and looming extractors rhythmically working, despite the downturn of that industry in recent years. The result is a bizarre experience for any outsider, however the warmth and generosity of local people can help to gain a nuanced understanding of the country’s past and where it’s headed. In terms of cuisine, Azerbaijan remains more similar to Armenia than to Georgia. This is most evident in the enormous variety of Plovs one will encounter on just about any menu – platters of rice for sharing, some laced with saffron, others studded with dried fruits and nuts, still others mixed with spiced meats or bejeweled with fresh pomegranate. The iconic national dish is a stew called Piti, made up of slowly cooked lamb, chickpeas, chestnuts and tart, green native plums. The fat from the lamb’s tail imparts an incomparable richness throughout. Piti is worth the trip to Azerbaijan all by itself, but the quality of the bread throughout the country and the quantity of fresh herbs and pickles provided at the start of each meal make for fascinating and addictive mealtimes. The traditional breakfast, too, is noteworthy, and may remind some Western travelers of a sort of early morning Spanish tapas. Imagine a tableaux of small dishes containing everything from eggs scrambled with tomato, to multiple butters and cheeses (of varying pungencies), to pickles, jams and jellies, and, of course, more bread. For outstanding Piti and a host of traditional dishes try Firuze or Sirvansah Musey, both in the capital. Ultimately, the countries of the Caucasus will be transformative for everyone from a first time international traveler to a proven globetrotter. Too often compared with other places and labeled alternately as either European or Asian in essence, they are truly neither…or both…and the challenge in describing, and perhaps in understanding this incredible part of the world, is precisely why it should be experienced firsthand. 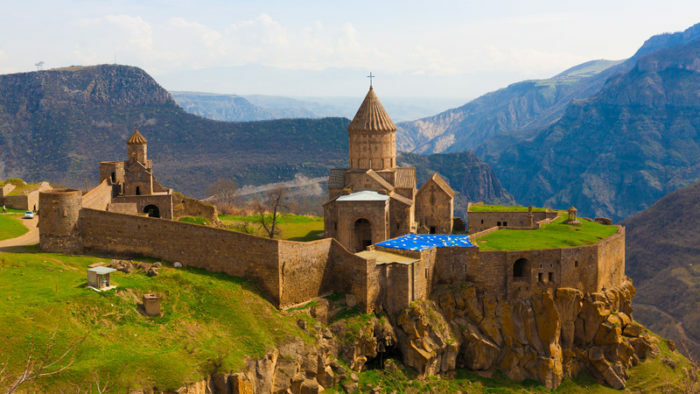 Visiting Georgia, Armenia or Azerbaijan at this moment allows the adventurous traveler to glimpse unique worlds not yet at the forefront of mass global tourism and to enjoy cuisines that they may otherwise never encounter. *Reservations in advance are highly recommended for those restaurants referenced in the above article. Ready to eat your way through this fascinating part of the world? Check out Peregrine’s 15-day Azerbaijan, Georgia and Armenia trip. Neil Coletta lives and works in Northern California focusing on all things Customer for Intrepid Travel. He abandoned his path as a career academic to see as much of the world as possible. Whether traveling or at home he’s passionate about traditional foods and is obsessed with animals.